Crosses at the ready as Red Hook Studios has released additional information about the Crimson Court DLC coming to Darkest Dungeon in early 2017. With this DLC being centred around vampires, with much of the promotional material referencing blood, it was only a matter of time before a vampire hunter entered the fray. One for spooks and scares? Here are some of the PC’s best horror games. 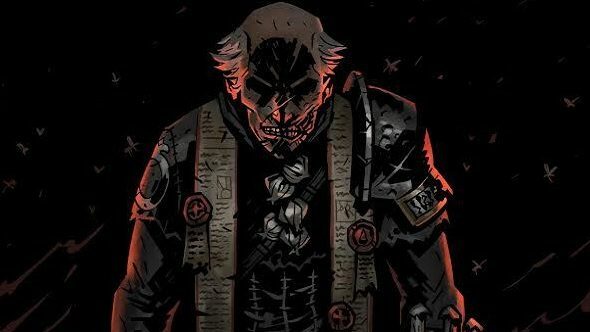 The Fanatic is a new roaming boss for Darkest Dungeon, hunting down parties if anyone has contracted the “Crimson Curse” disease. “The Fanatic will attempt to burn party members at the stake, improving his resilience by reading holy verses as the flames sear his victim”, says creative director Chris Bourassa when talking to Kill Screen about the Fanatic’s design. As long as none of your party members are afflicted by the Crimson Curse, this avenging priest should pass you by but should you have the whiff of a vampire about you, get ready for a fight. Rather than your traditional Van Helsing-esque vampire hunter with a tricorn hat, crossbow and hundreds of pouches, Red Hook have chosen to go with a “mad monk” design for the Fanatic. Bourassa imagines him as “having gone rogue from the church, hunting the Crimson Court anywhere he can find them”, rather than as your traditional monster hunter. With the giant warhammer, scripture hanging from his neck and multiple knives at the ready, the Fanatic seems partially inspired by the murderous vicar from The Night of the Hunter, striking down those he deems unclean with righteous fury. I wonder if he also has the words love and hate tattooed across his fingers. The Crimson Court DLC for Darkest Dungeon is set to release in early 2017, so watch its Steam page closely for any updates.